Basic scientific functions including hyperbolic functions. 390 Bytes of user memory. Because there was no complex "mode" and no "complex stack" as on the HP-15C, complex numbers were each entered into two levels of the normal stack. The calculator used the 27 lettered variables A-Z and i (indirection) rather than numbered variables. While these variables were used in much the same way as numeric registers, they were more than just a relabeling. The lettered variables were not allocated from memory until used and they could be individually deallocated by simply storing 0 in them. When RCL or STO was pressed, an A..Z annunciator appeared. The letters A-Z where printed to the sides of the keys. All the variables could be scanned with the VAR command. A single variable could be displayed without entering it on the stack by pressing VIEW followed by the letter. This was handy for debugging since it didn't affect the stack. 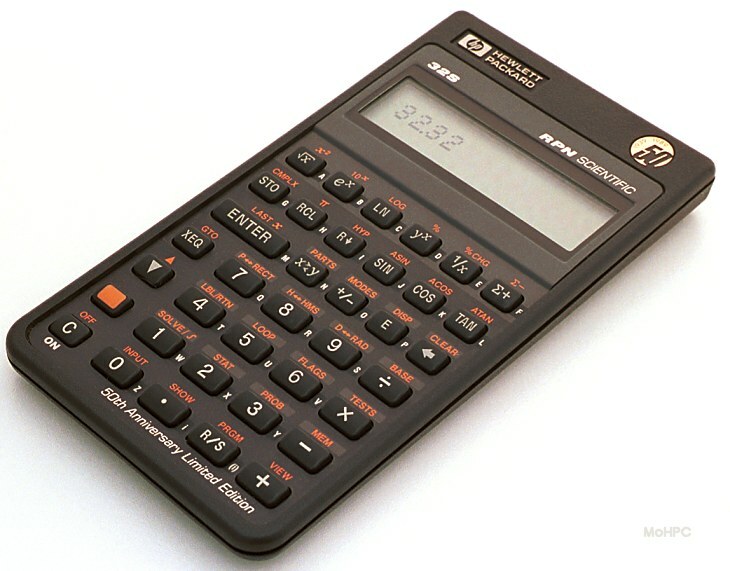 The programming features were impressive for a calculator of its price. The calculator used label addressing and allowed subroutine nesting to seven levels deep. To aid in navigating programs, line numbers began with the most recent label followed by two digits. (Like A01.) For very long functions, the next 100 lines were displayed as A.01-A.99 and the next hundred as A,01-A,99. Unlike most previous models, this one checked for duplicate labels and produced an error message. Indirection was available via the i variable which was distinct from the I variable. The index could be stored with STO i, and an indirect store could be done via STO (i). Labeled Input/Output via the INPUT and VIEW commands. Integer, fraction, rounding, absolute value. The HP-32S featured to the first RPN solver. 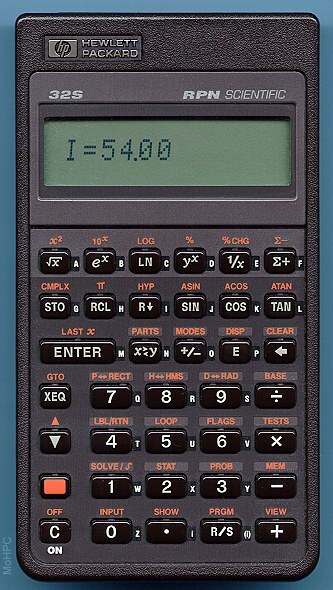 The HP-34C had introduced the first built-in root-finder which could solve for f(x) = 0 expressed as an RPN program. To use the root finder the user wrote a function that accepted x, and left f(x) in the X register. The RPN Solver on the HP-32S allowed the user to enter a program which accepted multiple variables and computed f(a, b, c, ...) = 0. After entering a single program, the user could solve for any variable. Displayed SOLVING and then NO ROOT FND since it is impossible to go from 10 to 100 with zero acceleration. About 20 years before the HP-32S, a four function electronic calculator cost around $10,000 of today's dollars. The HP-32S offered a list of functions that few people would have dreamed of in 1968 for 0.7% of the cost. 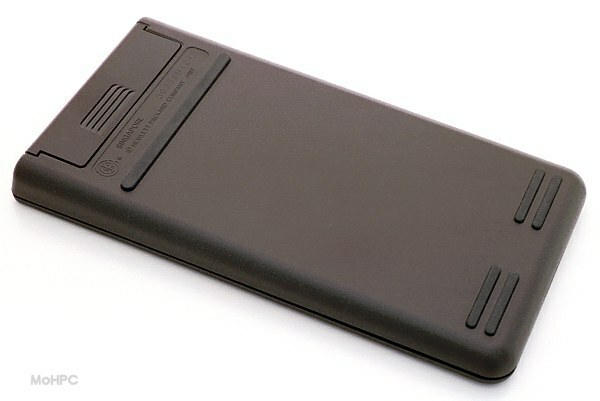 In addition, it was tiny, light weight, simple to use and ran just about forever on batteries. 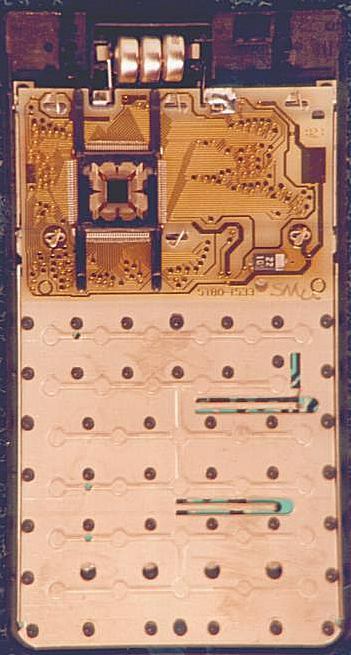 Internal picture (~79K) Note CPU held in place by plastic "backbone". Image by Paul Brogger.